Struggling to Make Data Actionable with SAP BW? Struggling to Make Data Actionable? I’m often asked the reasons why a business would need some form of data platform. The answer is ultimately it needs information to support decision making. The systems delivering such information over the years have been given a variety of names such as “management information systems”, “decision support systems” and “data warehouses”. Ultimately, these systems needed to deliver a broad range of capabilities to managers and initiatives were hindered by technology products of the time. Why were they struggling? SAP BW was introduced to SAP customers as the data warehouse of choice enabling business users to gain the operational insight they required from the SAP ERP investments. Different from other market solutions which took an Inmon / Kimball approach to SQL-based data warehousing, SAP chose an object-oriented route with SAP BW. However, over time the SAP technology portfolio has been a complex subject to navigate. From the initial inception of SAP BW back in 1998, organizations have been faced with a “Marmite” moment – you either love it or hate it. For many organizations, the ability to enable business content in a reduced timeframe provided the necessary operational reporting they were seeking but failed to provide true insight. For others such as small to medium sized enterprises, the IT complexity of delivery would always be one-step too far and other methods were sought to provide insight. Large enterprises did not escape issues either. Their business requirements introduced additional complexities associated with Integrated Planning, EPM and POSDM along with a variety of technical solutions for dealing with very large data sets found within certain industries such as Retail and Financial Services. Ultimately, whatever barriers an organization had for adopting SAP BW just shifted the problems to a different part of the business and away from IT. Through discussions with many SAP customers, I have found continued frustration through inability to get true insight in to their business operations. Business users are wasting time extracting data from SAP ECC tables, creating Infosets, ABAP and ALV screens ultimately delivering BW equivalent functionality in Excel, external Data Warehouses and Tableau/Qlik rather than delivering insight from a trusted model of data. For many SAP BW customers the journey is one towards simplification; simplification of the overall technical complexity of the existing landscape. This simplification introduces agility to react to new business demands and create responses to new ways of working. To support customers with this journey, itelligence has developed proven methodologies for upgrading SAP BW customers and simplifying their overall SAP BW landscape. Set within the general backdrop needing to get operational reporting and traditional data warehousing correct, businesses are now faced with emerging trends that challenge their business models and more importantly the cottage industries they have developed. Enabling a trusted data platform is only part of the picture and organizations need to provide appropriate responses to analyzing the data so businesses can innovate and response to the demands faced. Organizations are faced with wide-ranging forms of data, which can form the basis of further insight. These new data sources are driving the need for improvements in analytical capabilities beyond standard business intelligence and reporting and into the world of real-time analytics, geospatial analytics, predictive analytics, network analytics and sentiment analytics to name a few. Through product development innovation, SAP has created a next generation response to data warehousing with SAP BW/4 HANA. SAP BW/4 HANA still provides rich business content now optimized for SAP HANA but also provides additional capabilities enabling businesses to respond with agility to the demands they face. 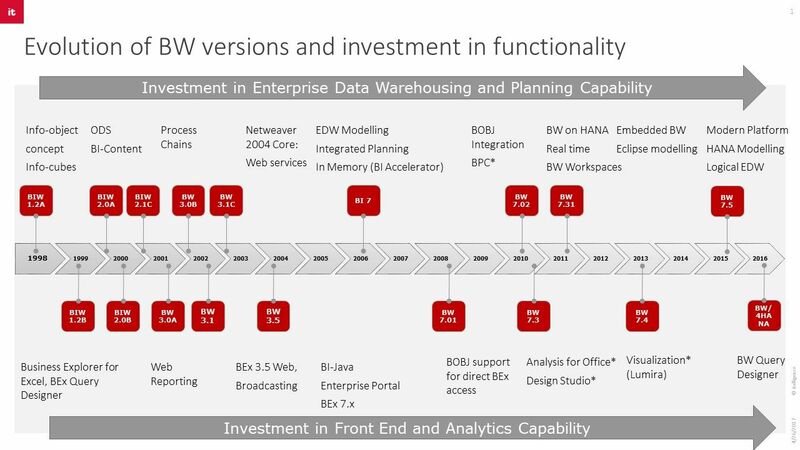 In essence, SAP BW/4 HANA is a modern analytics platform catering for the additional demands that pure play data warehousing could never address. The rest of this blog series will explore the nature of SAP BW/4 HANA and the benefits it brings to business users, functional managers and executives. The series will also explore the capabilities we seek to develop new responses in such a technology platform to respond to customer and competitive pressures within your markets. We will explore the capabilities found within SAP BW/4 HANA and how these capabilities can provide insight to support decisions in response to operational, tactical and strategic challenges faced by businesses in today’s digital world. Learn more about BW/4HANA by downloading our on-demand recording featuring Hans Paulokat to learn what’s new in BW/4HANA and what the migration paths are. This replay covers the biggest changes for customers considering moving to BW/4HANA as well as the new features and functionality. To learn more about SAP’s next generation data warehousing known as BW/4HANA, watch this short video.